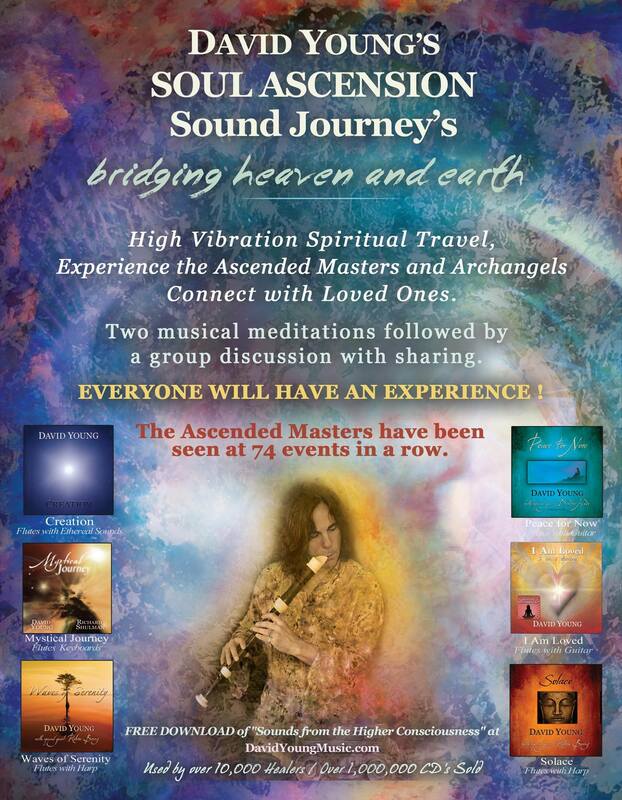 EVERYONE WILL HAVE AN EXPERIENCE- either with an Ascended Master, an Arch Angel, a past life experience, an out of body experience in the inner light or with one of their loved ones already in Heaven. David Young is a twice Grammy Nominated musician who plays two renaissance flutes at one time in harmony. He has recorded 57 albums and sold over 1,000,000 copies. He is a healer, channel, writer of three books, artist and it is said that more people have had out of body experiences while listening to his music than other musician alive today. Whether people have been meditating a short time or for thirty years, attendees consistently say they’ve had the most profound, spiritual experience of their entire life, such as Marie Diamond, Fung Shui Master and speaker in the movie, “The Secret” who came on stage after one of David’s performances and announced this. Barbara Hardie, writer of the book, “Creating Heaven on Earth”, well respected medium and angel channel from MA who has been meditating for 25 years had a healing at her first event and shared that she had “the most high vibrational, spiritual experience of her life” at her second event. She has been to four events now and each one brought her to a higher level than she ever thought possible. David has done over 100 Soul Activation workshops this year, traveling to three or four cities each week. For the past two months, AT EVERY EVENT, people have consistently shared their experiences with either Buddha, Jesus, Lao Tzu, Quan Yin, Mother Mary, as well as Edgar Cayce, Gandhi, George Harrison, John Lennon, Ravi Shankar, and the Egyptian Goddess Isis. Although each experience is unique, many share that these great teachers have told them we are all One and we are equal and there is no need for the pedestals that mankind has put them on. David’s wife Dawn has had nine experiences with Kali, the Goddess seen with six arms. On separate evenings two people had the exact same experience with Buddha who brought them to this gigantic tree (The Tree of Life) that was so tremendous it was beyond their description of words. It is a privilege and sheer pleasure for David to share his music and this energy with the community. Contact Ellen at 516-924-1399 to reserve your spot.